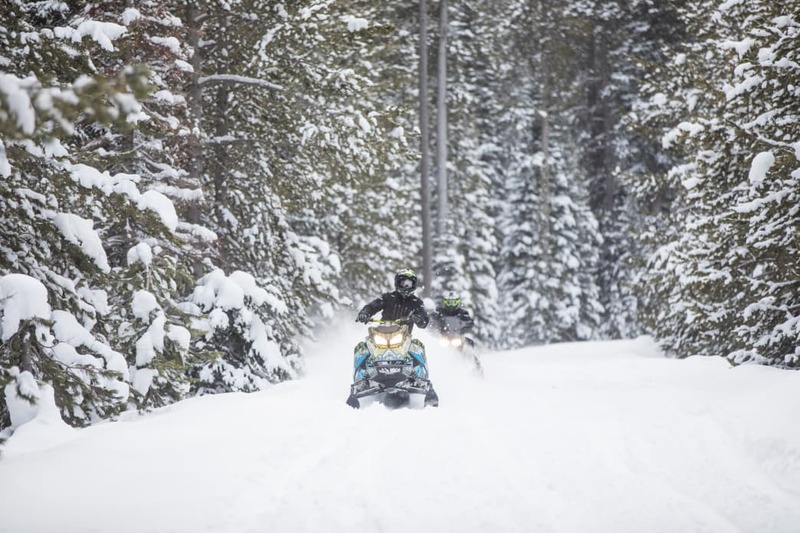 As we sail through the silent forest on our sleds, large flakes fall slowly on the Sinks of Northern Utah. The Sinks are a natural limestone sinkhole in Logan Canyon, and have the dubious distinction of being the coldest spot in Utah. They are also known for the second-coldest recorded temperature in the lower 48 states, -69.3 degrees Fahrenheit. Single file, we follow a lonely path through a massive field of white. Off the trail the powder is deep, billowy, and inviting. In the distance the trees provide contrast — this is where our options expand. Thankfully, it's not that cold when I visit, though I've layered appropriately and prepared for the experience. And while those extreme, cold temperatures can translate to light snow, I am told, there are plenty of beautiful, sunny, blue-sky days at the Sinks. Today is overcast, however, and seemingly solitary — a little unexpected for a Saturday afternoon. It has been quite a while since I last rode. I am by no means an avid snowmobiler, but I guess I might qualify as "experienced" in the loosest sense. As I ride, I am reminded of trips near Monte Cristo, Ben Lomond Peak and in parts of Summit County, east of Park City. The Sinks have their own unique character and landscape, however; it's a part of the Bear Lake region that I am wholly unfamiliar with. Nate Smoot, owner of Epic Recreation, is one of a handful of recreation vendors in the Bear Lake Valley. "He's probably the best snowmobiler I know," says Bryce Nielsen, a former mayor of nearby Garden City. Smoot is guiding us through the Sinks, and along the way he shows off his snowmobiling skills with high speeds, higher jumps, and smooth landings. Just how good is Nate Smoot? 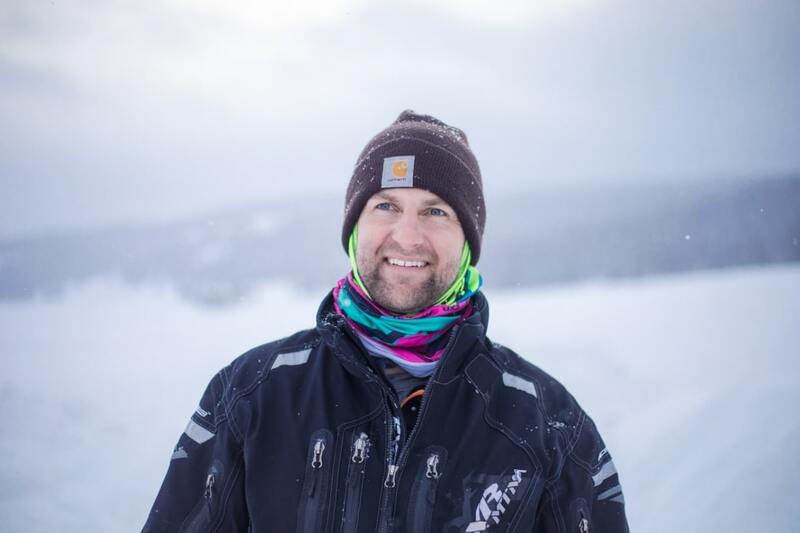 The following week he is traveling to Russia to teach snowmobiling, he explains. Of course there are Russians capable of teaching others to snowmobile, Smoot says, but they would rather have an American. Apparently, it lends legitimacy to their newly acquired skills. Despite the long layoff, I'm a pretty confident rider. Riding with Smoot, I am keenly aware of my own snowmobiling limitations. I suppose I've moved into a new life stage. You know, the "I could do that, but I'll leave the showiness to the younger guys," stage. Snowmobiling in 2018 is a different experience from that of the 80s-child — bundled up but still bitterly cold, sitting on the back of a boxy, early-model Ski-Doo on its way to Old Faithful — that I remember. These newer machines feature heated seats, handles, and throttles, plus considerably more power. And even in a low-snow year, the extensive trails and relative seclusion of the Sinks mean surprisingly good terrain. 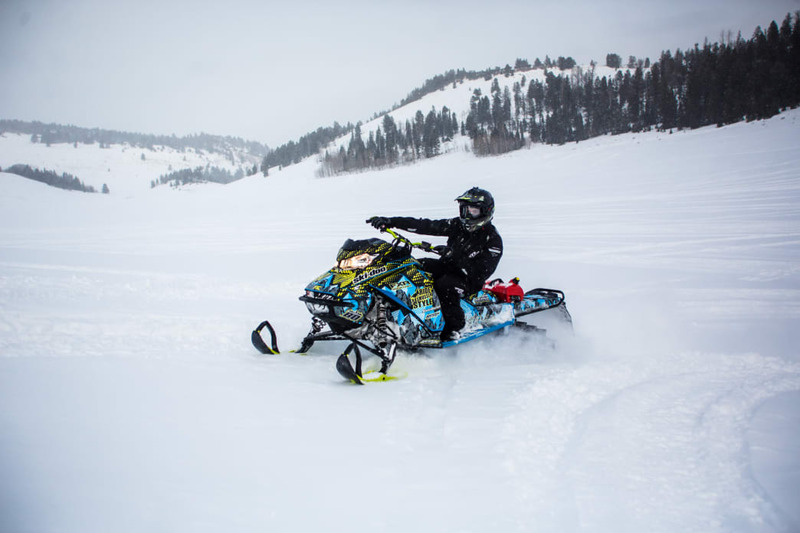 "For snowmobiling trails, we have a comparable offering to Jackson or Yellowstone," says Joey Stocking, owner of Bear Lake Condo Rentals. 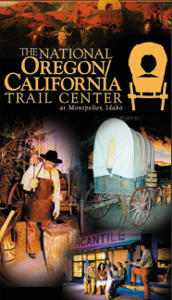 There are over 350 miles of trails in the Bear Lake region. According to Stocking, most of his winter visitors come for the snowmobiling or skiing at Beaver Mountain a few miles up the road. Driving to Bear Lake from the Wasatch Front was once a very different experience — first traveling along a narrow I-15 to a narrow U.S. 89 through Sardine and Logan Canyons. Thanks to wider roads and higher speed limits, it's a quicker trip today, approximately two hours from Salt Lake City. And while the travel time has gotten shorter, the anticipation of the arrival remains oddly similar to decades ago. There is special feeling about returning to Bear Lake, says Bryce Nielsen, former DWR fisheries biologist for the area. "I've traveled around the world extensively," he says, "but still, when I come back, and come over that hill, you know — I know I'm home." And that approach to the lake is pretty grand. It starts with a nearly 40-mile drive through the federally-designated Logan Canyon National Scenic Byway. "When I hit the canyon, I think, 'Oh good, I hit my driveway,'" says Bobbie Coray, editor of the Rich Civic Times, who lives in Garden City. The road traces alongside the Logan River, which is frequently dotted with fisherman. It carves its way through the pass, sometimes nearby, sometimes far below. Exploring the extensive trails and relative seclusion of Peter Sinks area. As you near the end of the drive, still high above the lake, the water suddenly comes into view. "[People] fall in love with the lake when they come over and see that blue color," Nielsen says. And although it is winter, the striking blue of the lake is no less impressive, wrapped in the white of winter's snow. 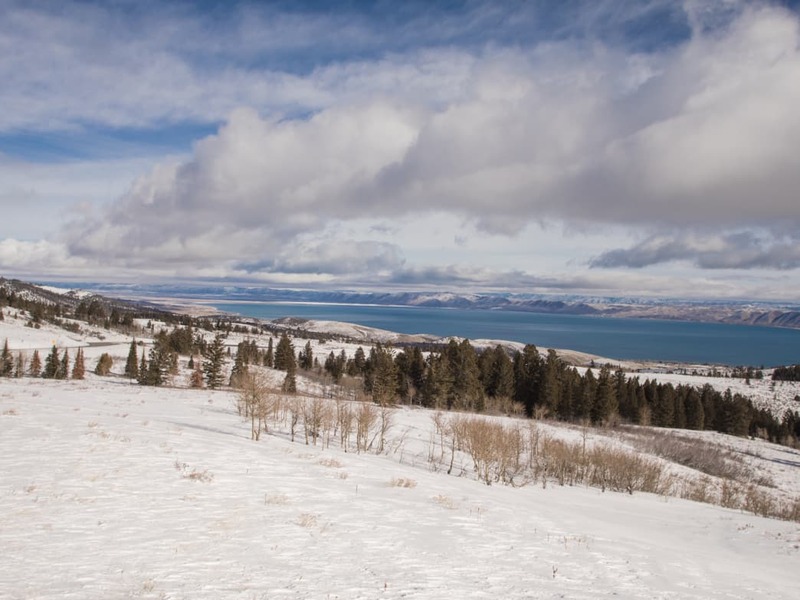 Drawn by these landscapes, Smoot's father, Mark, began investing in real estate at Bear Lake several years ago and started Epic Getaways and Retreats, a boon for visitors to the Bear Lake area looking for a guided experience. According to Rose Noorda, Epic Getaways and Retreats on-site manager, the summer can be pretty crazy for locals. Epic's added a convention center in the spring of 2018 to draw even more visitors, especially to seasons that don't get a lot of traffic. Andy Stokes, manager of the local Ace Hardware, refers to the Bear Lake calendar year as a "high/low market." "In the summer, obviously, I mean, to keep up is insane, we're running like crazy," he says. It's strange to think about when I consider the calm streets and absolute quiet of the nearby backcountry this time of year. Of course, the vast lake has plenty of space to pursue solitude in the summer as well. Snowmobiling in 2018 is a different experience from that of the 80s-child that I remember. These newer machines feature heated seats, handles, and throttles, plus considerably more power. "But then the other, you know, nine months of the year, we hunt, we fish, we play, my kids raise 4H steers, go to the county fair, they did pigs last year. And I'm on the volunteer fire department so that keeps me a little busy there." "They have a women's quilting group every Tuesday," adds Corey, "and we have Empty Nesters and we have . . . well, we just party all winter long. It's fun." Outside of the Bear Lake Monster Winterfest, coming to Bear Lake in the winter is a little more mellow — snowshoeing, skiing, ice fishing, sitting by the fire and drinking hot cocoa. "There are a lot of places I love to visit," Nielsen says, "but I wouldn't want to live anyplace else." The bustle of the lake and lakeside community in the summer makes it easy to overlook the canyon and surrounding mountains as you make haste to the water. And it's true, the winter is comparatively quiet around the lake. Tourism is the lifeblood, and many residents would welcome additional winter visitors, but when the community settles in for the off-season, everything takes on a quainter, familiar tone. And that is part of what makes the "rest" of the year at Bear Lake so enticing.